The $21 Million TattsLotto Superdraw is coming up on Saturday 10th September. Call in today and pick up your ticket to dream or contact us to reserve your syndicate shares. 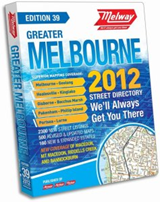 As a gift for Father’s Day or simply to update to the latest edition Melway, the 2012 Melway Street Directory is out now and is on special this month for just $41.95. From the publishers of The Age we have arranged two special home delivery offers of The Age from just $5.00 a week for 20 week 7 day home delivery or just $3.50 a week for 20 week Friday to Monday delivery. These offers are only available for a limited time. The 2012 VTAC Guide is is now available in store for just $15 a copy. You’ll find the link to join us on Facebook on our website at www.pattersonroad.com.au.